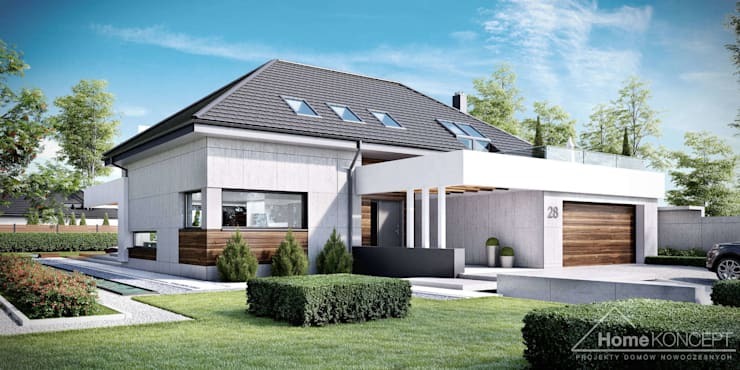 If you’ve been dreaming of a modern, elegant, spacious and visually pleasing home that could accommodate both a growing family and active lifestyle, then today might just be your lucky day. Yes, today’s homify 360° discovery shines the spotlight on a super modern creation conjured up by the professional team of HOMEKONCEPT, experts architects in Kraków. Their project manages to tick all of the aforementioned boxes, and does so with a contemporary style that makes this house the ideal abode for the 21st century. 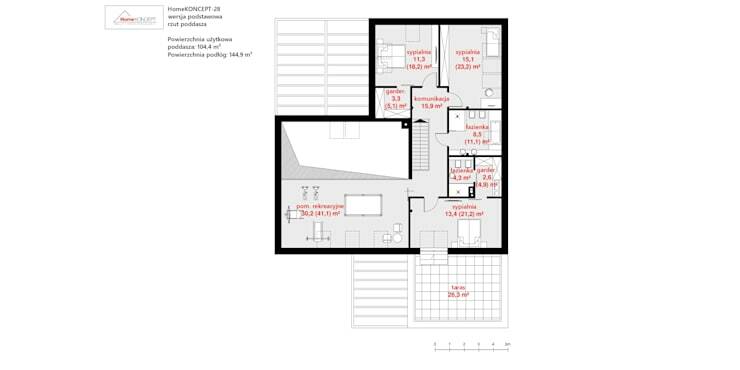 What’s more, they’ve included the floor plans, which means you can copy it if this particular layout is what you want your dream house to look like. The two-floor house has a certain seriousness to its façade. But don't mistake that for being boring, because the details here get more interesting the further we explore. 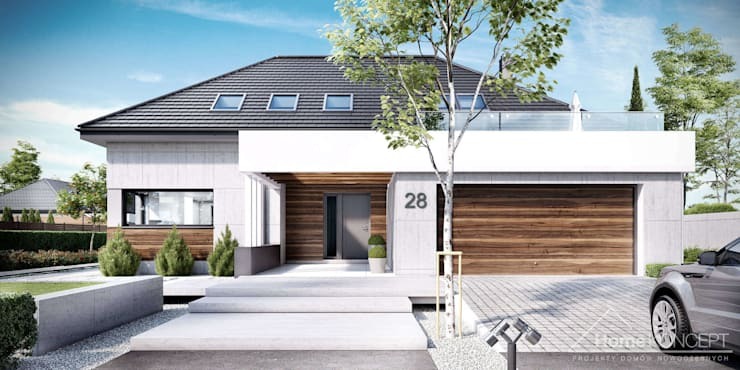 The first thing that catches our eye is the neat wooden panels in a rich brown hue which beautifully adorn certain areas, including the garage door. Don't they just add the perfect textured look? The geometric effect of the house’s build continues to dazzle, regardless of how we change our vantage point. The front garden also complements the sharp sophistication of the house. Meanwhile, the open terrace on top of the garage subtly attracts passers-by with its glassy balustrade. Time to see what the insides have to offer! 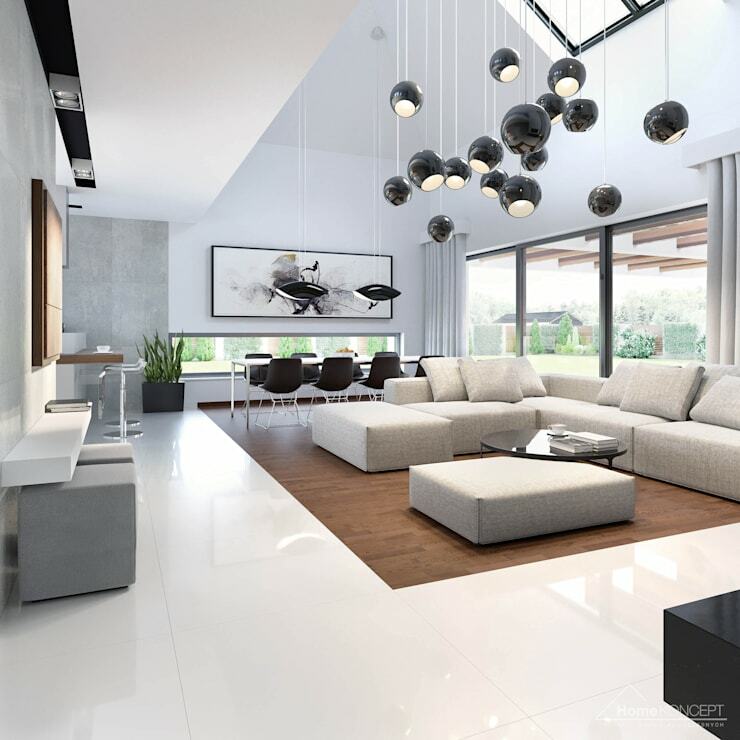 The living area adjoins the dinner table, both of which are placed on a wooden flooring surrounded by glossy white tiles for an oh-so sleek effect. The monochrome palette, together with the brilliant lighting fixtures, just takes our breaths away. And there is absolutely no overlooking the high ceiling which follows the shape of the gable roof with those dramatic skylights. In terms of furnishings, the interior designers followed a minimalist scheme, opting only for the necessities and a handful of decorative items. Over at the dining side of things, a modern no-nonsense dining space is situated, which is also seamlessly connected to the kitchen in the background – a sure-fire way to enhance the social ambience of the house. 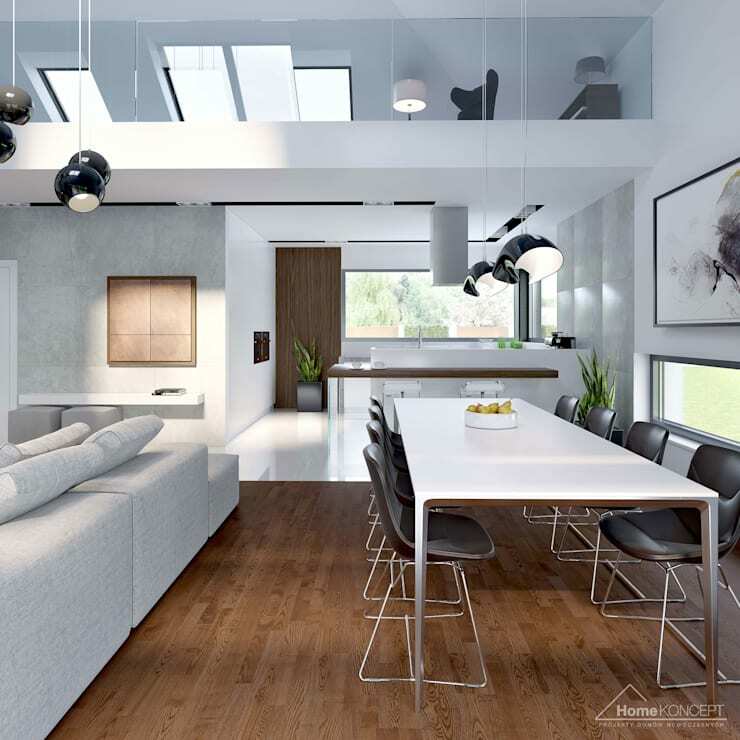 Don’t miss the skylights visible from this angle, which definitely help to introduce an abundance of fresh natural lighting into the house! If you consider yourself a devout follower of the minimalist style, then this kitchen might just float your boat. 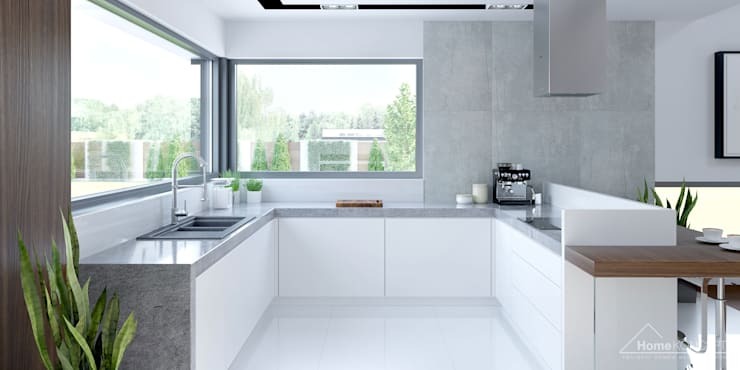 Strong lines, light neutral hues and a clean look is what make up this corner culinary area, which definitely seems capable of keeping even the most seasoned chef busy. And we just love the touches of fresh greens in the form of potted plants, which go a long way in not only freshening up the interiors, but also adding a touch of nature into the neutral colour palette. 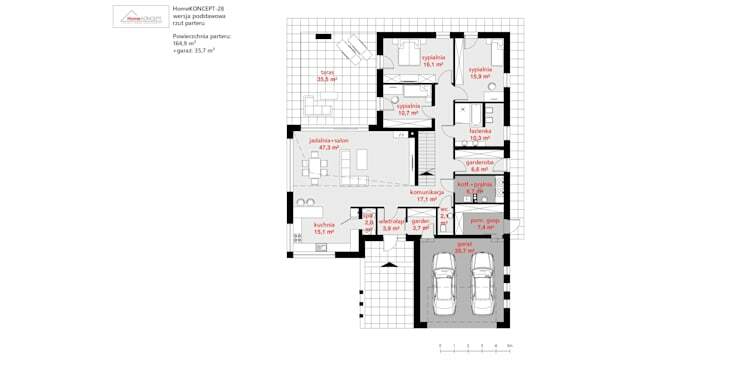 The ground floor spans 164.9 m² and includes three bedrooms, one bathroom, a laundry room, the living- and dining area, plus the kitchen, a garage, and the back terrace, amongst others. More than adequate space for a growing family, don’t you think? The total size of the second floor clocks in at 144.9 m². This level contains three bedrooms, two bathrooms, and a recreation area. The latter was partially seen from the dining area earlier. And we can also see the balcony that's visible from the front (which is situated atop the garage) is accessible through one of the bedrooms. A picture-perfect family home? We definitely think so! Now for something completely different: The fantastic house on the hill.